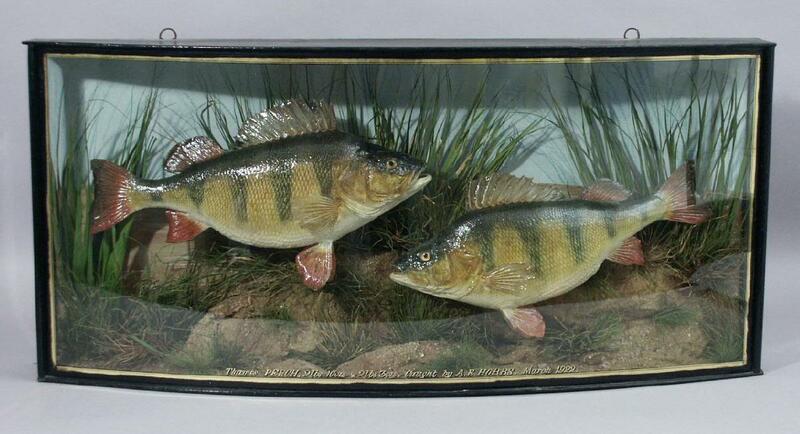 Two preserved and cased Perch caught by AE Hobbs in the River Thames in March 1922, weighing 2lbs 10 oz and 2lbs 3 ozs. Colour - Its flanks (sides) are pale green with dark bars ruiniing from the back. These bars vary in colour and number from 5 to 9. Its belly is silvery green. Size - This depends what food is available. Adults are often bewteen 15cm and 30cm (6-12 inches) and weigh up to 2kg (4/5lb). Characteristics - Its dorsal fin (on its back) is grey with a large dark spot at the back. Its second dorsal fin is yellowish. Its pectoral fins (on its side) are brown. The other fins and the tail are pink, orange or red depending on its age, the time of year and the water in which it lives. Diet - It eats small fish either dead or alive, crustaceans and molluscs (animals in shells), insect lavae and worms. It is not fussy and will eat most living creatures that it can. Habitat - The perch likes slow flowing rivers, like the Thames, and lives in large shoals (groups). It avoids cold quick waters. How fished for - Anglers use live or dead fish as bait such as minnows and gudgeon but also worms or maggots or artificial baits called lures. Many anglers catch perch by float fishing but in deep water ledgering is used. Ledgering involves the use of lead weight to keep the bait near to the bottom of the water.